This gag concerns itself with another kind of American Expeditionary Force; when Pershing's Doughboys left, they were replaced by the American tourists. There is another article on this site that states a popular belief held by the Europeans of 1919 that American men were all clean shaven, tended to sport gold teeth, and were most easily recognized by their "big tortoise shell glasses"; however, this is the first visual manifestation of this caricature that we could find. This cartoonist did not simply believe that this was a fitting description of the white guys, but black guys, too -and the women as well; an entire nation resembling Harold Lloyd. Cartoonist Gluyas Williams (1888 - 1982) would in no way be shocked to learn that the U.S. Senate is still occupied by pompous, old, wind-bags. A cartoonist at PUNCH MAGAZINE had a laugh at the expense of Germany and it's humiliation during the first few days of the Armistice. A good nine-panel cartoon that appeared in an American veterans magazine on the first anniversary of the Armistice. What is especially amusing is the satirical depiction of American front-line officers and the last frame, which fully supports the thesis of Joseph E. Persico's book, "11th Month, 11th Day, 11th Hour" that the American Army was on the attack all the way up to the bitter end. Cartoonist Rea Irvin (1881 - 1972) did the work of ten George Creels during America's participation in the Great War by consistently producing a number of funny gags that served to belittle Imperial Germany. 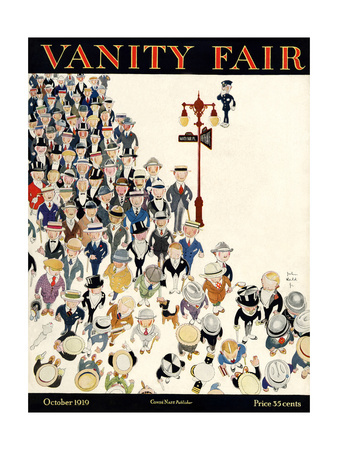 Unlike most cartoonists who were active during the Gilded Age, Irvin has been published at least once a year every year since 1925: he was the creator of 'Eustice Tilly' -the Regency dandy who graced the very first cover of THE NEW YORKER that is re-printed every February. Other cartoons in this series are available upon request.